Whew, what a wild ride! If Geoffrey Beevers’ delightfully evil Master weren’t enough, this story has more twists than a TARDIS walking tour. Alan Barnes apparently decided that since he didn’t have a crowded TARDIS to worry about, he’d throw four or five interlocking plotlines at the Doctor, each with their own casts of characters. The poor man has to juggle all of them while trying to keep the Master’s old TARDIS out of the wrong hands. At times the Doctor is subsumed by wheels within wheels, secrets within secrets, and agents with conflicting agenda. Nevertheless, this is a fun, well-plotted thriller/mystery that keeps unfurling new surprises throughout. Peter is in fine form, although he’s necessarily absent for parts of the drama. Beevers is delicious during the story-within-a-story flashback. He so revels in this sort of script. The other players hold up their end: teens and crooks and secret agents and all the rest offer color and someone to care about in lieu of regular companions. They provide the Doctor with someone to protect and someone to thwart, often both at the same time. The audio’s ending suffers a little because there’s only so much the Doctor can do and resolve, especially since he can’t defeat the Master forever. On the other hand, this is Five we’re talking about, with a compassionate and self-sacrificial streak to make up for his fallibility. Some of the ideas in this script are fairly off-the-wall: not quite “the Master can turn into a shapeshifting ghost snake” wild, but certainly up there with the Melkur or malevolent plastic daffodils. 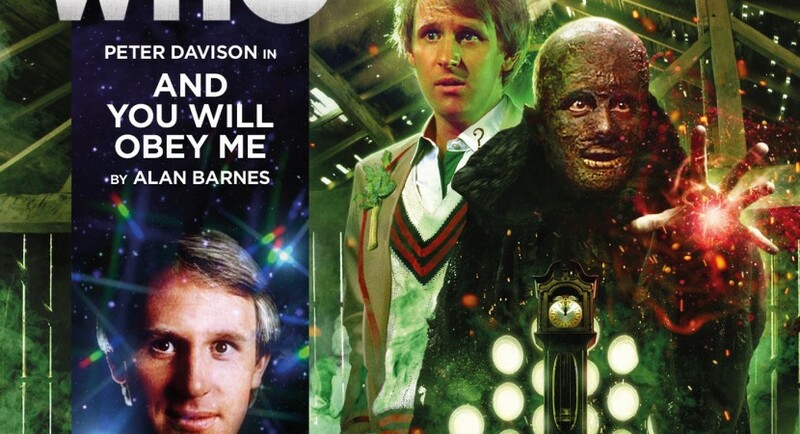 I’m impressed that Barnes was able to find a way to reconcile the timeline of Beevers’ Master and the Fifth Doctor, to account for Ainley’s absence. It actually works, although I had my doubts until near the end. Most of all, I love the way the Master’s clock-TARDIS is woven into this story. The Doctor’s TARDIS is so integral to his character. Surely, after all this time, the Master’s TARDIS deserves a little more recognition than it usually gets. I love the fact that both TARDISes are minor but real characters in this audio. In typical Big Finish fashion, this story shoehorns into the aftermath of The Awakening. I had forgotten that Tegan talked the Doctor into sticking around on Earth for a few days so she could visit with her grandfather. I liked the complexity of the various characters chasing after the Master. Most are so morally ambiguous that it’s difficult to tell who’s villain or victim, whom the Doctor should help.Annie, of course, proves to be as interesting as I hoped she’d be. Her storyline alone might’ve been an entire audio in some other author’s hands. Even the Doctor plays the moral ambiguity card: for some time, he’s not quite sure whether he’s come to thwart the Master’s plans or rescue him from other people’s. I am in awe that Barnes crammed so many different elements into a story that would already have been quite dramatic enough if he’d just stuck with the four teens and the Master. But then, of course, the Doctor wouldn’t have much to do. Instead he winds up refereeing what would almost be a farce, if it weren’t so deadly serious: auction house, haunted house, Russian agents, British agents, nukes, a UNIT cameo, giant sentient dragonflies, and those obnoxious androids from Galaxy 5. Also, I think this story retroactively explains why Crispy!Master looked different in Keeper of Traken than Deadly Assassin. Finally: I haven’t thought of “Relax” from Frankie Goes to Hollywood since I was in junior high. Thank you so much, Alan Barnes, for getting a 30-year-old earworm stuck in my head. Immediately after The Awakening, TV Season 21. Tegan and Tegan have gone off with her for the day to a a quarry (“busman’s holiday”) to source stone to repair the church. Mikey, one of the children ensnared by the Master, comes to confide his troubles to Miss Hampden, his favourite teacher. The Doctor, unaware of Mikey’s troubles, offers to take a message, but Mikey declines. Then the Doctor hears the TARDIS clanging, which turns out to be the Master’s distress call. He says goodbye to Mikey and follows the signal forward to 2016, inadvertently leaving poor Mikey in the Master’s clutches. The Fifth Doctor’s audio adventures keep spawning unfortunate time loops. (Creatures of Beauty, Circular Time: Winter, Prisoners of Fate).